We were able to escape the flu this year. In January, Brian and I decided to keep Avonlea from preschool for about six weeks and we decided to stay away from the public as much as possible. This turned out to be a good decision. Our entire family stayed very healthy throughout the winter. We even pushed back Bennett's quarterly CF appointment until Spring to prevent Bennett being needlessly exposed to the flu. So, Bennett finally had his CF Clinic appointment today. To our surprise, Bennett's lung function went down. It is so weird when this happens because he's showing no respiratory symptoms. Our CF doc thinks the lower lung function is either a fluke (Pulmonary Function Tests, known as PFTs, can be difficult for kids to get just right)...or she thinks it's due to a typically common bacteria called MSSA (Methicillin-sensitive Staphylococcus aureus). 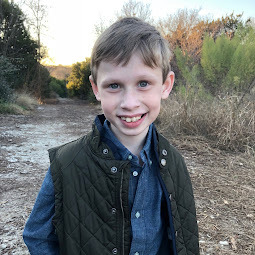 Because we've seen his lung function drop before, Bennett will be given a round of oral antibiotics to treat MSSA, which worked in the past. There's a chance that this drop in lung function could be due to some other bacteria or fungus in his lungs. But we won't know this until we get back our routine throat culture results next week. In general, people with CF have a 3% drop in lung function each year. But, it feels pretty worrisome when it happens without explanation. Today's lower lung function is just a signal that CF is working behind the scenes against us. 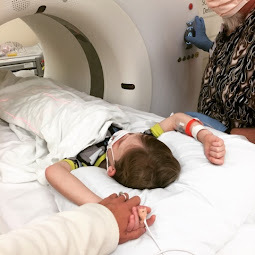 Eventually, if we can't get Bennett's lung function back up, Bennett will require IV meds and a lengthy hospitalization. We aren't there yet. But we're inching closer each time this happens. It's so frustrating to have CF slowly take away Bennett's ability to breathe and not to really be able to do much about it. There are meds to treat. But the meds really just delay the inevitable. I don't feel hopeless. But I do feel helpless. Bennett's lungs have been so healthy. 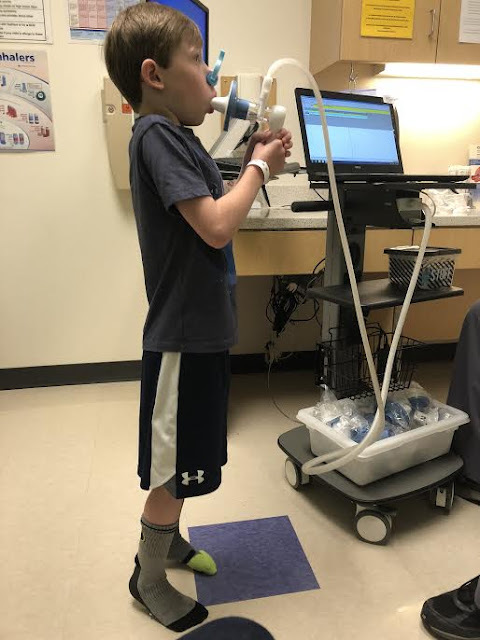 He's eight years old and so many children with cystic fibrosis never get to age 8 without an exacerbation or without a serious lung infection. So, we feel tremendously blessed that he's this healthy this far in to his life. But, I still feel sad about today's drop in lung function. To add to my feeling a bit bummed about today's appointment, Bennett continues to grow on his growth curve (height and weight) but he's still underweight and under where we all want him to be. He needs the extra weight to help him grow taller and to help him address future health issues he's inevitably going to run up against. Good nutrition is really critical. But, weight gain feels so elusive to me. It seems so simple. But it's a mess to organize. I have to have the feeding bags, extensions, the feeding pump, syringes, the Reliazorb medication, the Liquidgen liquid fat and the formula. Only three of those items insurance will pay. In addition to the 15 minutes it takes two times daily to set up the feed, Bennett has to find an hour in his day to be sitting on the pump. 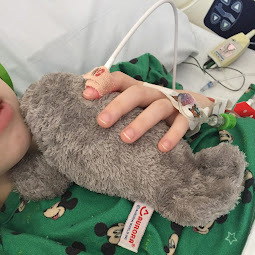 Of course the feeding pump has to be charged and Bennett has to be able to tolerate the forced feeding, which often causes him to feel nauseous, overwhelmed by acid reflux and gastrointestinal issues. Very often, by the time we get one thing in, we find ourselves running up against something else with CF that we haven't gotten in. I end up having to prioritize his CF care to evaluate which of the things gets "bumped" for the day. 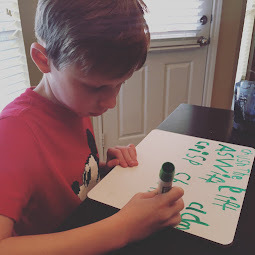 Every day I set out to do all the things on the list of things to do for CF. And every day, I feel the struggle of managing CF, as well as everything else within my power to manage in my role as a parent, wife, friend, daughter and healthy-self. What's equally hard is knowing in the back of my head that CF doesn't quit. CF doesn't go into remission. In fact, it just gets harder, throwing bigger punches as time goes on. To prevent feeling discouraged, we work to celebrate the joys we have right now. Delaying CF's erosion of the body is still a huge win. Bennett's lung function went down but his lungs still sound great. Bennett hasn't gained as much weight as he needs. But he didn't lose any and is continuing on his growth curve. I am confident we'll get that lung function back up and will make strides in his weight gain. We made it through a pretty yucky flu season. We'll make through this hiccup as well. My heart absolutely breaks for your family. Bennett is so lucky to have a mother like you who can stay strong and give him everything he needs. (Not saying you shouldn't take a break every now and then with your husband or a friend, some wine and a good sob!) I have a hard time balancing my time between mother, wife, friend and business owner... I cannot even come close to imagining what you are going through. You are a true super woman and I admire you. I know when you're in that situation, you just do what has to be done. But not all can. You are! Absolutely amazing. I was a KD at MU with you for a short time. I still remember your infectious smile, kind heart and helpful demeanor. I also remember you being quite skinny, so I'm guessing Bennett takes after you. �� He'll get there with your support. Thank you for sharing your story. It helps me to remember my problems are small and to continue helping those that need help much more than I do. Sending prayers to your family. I can totally relate to CF dictating your routine each day and to the despair when you do everything you are supposed to and their lung function drops. I just wanted you to know you aren’t alone. It's Paola Cruzet, We pray for Bennett every single day. We remember y'all and think of you often.